The Andean parakeet (Bolborhynchus orbygnesius) is a small 160 mm (6 in) parrot found in the upland wooded valleys of the central eastern Andes in Bolivia and Peru, at elevations of 1,500 m (4,900 ft) to 5,000 m (16,400 ft). It is solid green, darker above and lighter below, with some blue visible on the wings when flying. It has a pale bill and medium length tail. 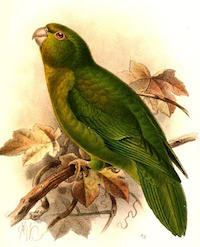 It is stockier and darker than the mountain parakeet. Most flocks are small, but sometimes include over 300 individuals. The Andean parakeet eats seeds, buds, and berries, and it breeds in burrows in steep banks. for supporting this project. Our next scheduled release is at 15 Mar 2016.